‘Tis the season for short(er) approaches, shorter days, and lots of try hard. 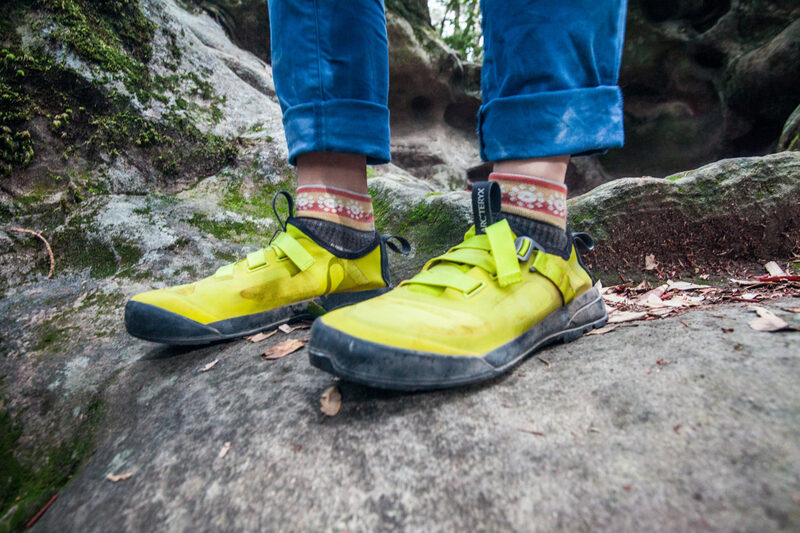 When you’re at a crag with a high concentration of problems, who wants to put real shoes on to move 100 feet to the next route? That’s where the Arc’teryx Arakys approach shoe comes in handy. Is it a shoe? Is it a slipper? The answer: both. When you’re on the approach, it’s shoe mode. 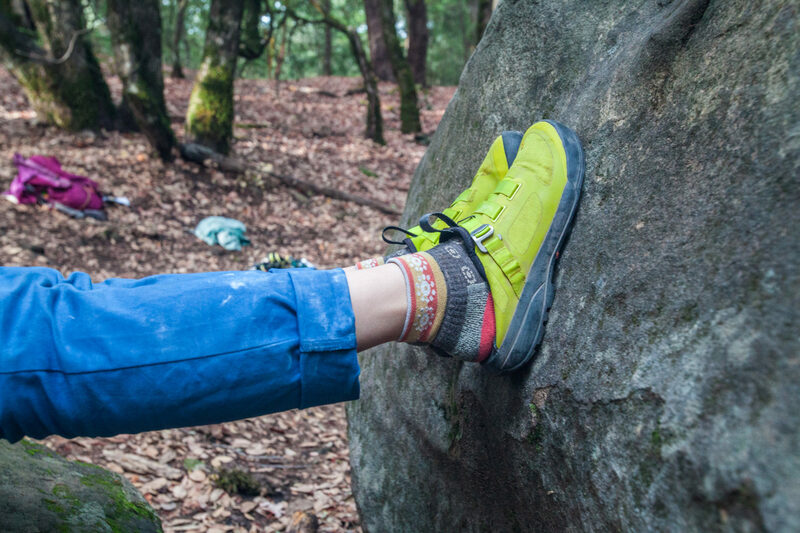 When you just got off the wall, your climbing shoes are off and you’re trying to get the feeling back in your toes, the heel collapses down for slipper time. The shoes are lightweight, weighing in at about 1lb and 0.2 oz per pair. The footbed is constructed of leather, while a seamless one piece upper with thermolaminated construction is highly abrasion resistant, durable, breathable and hydrophobic. 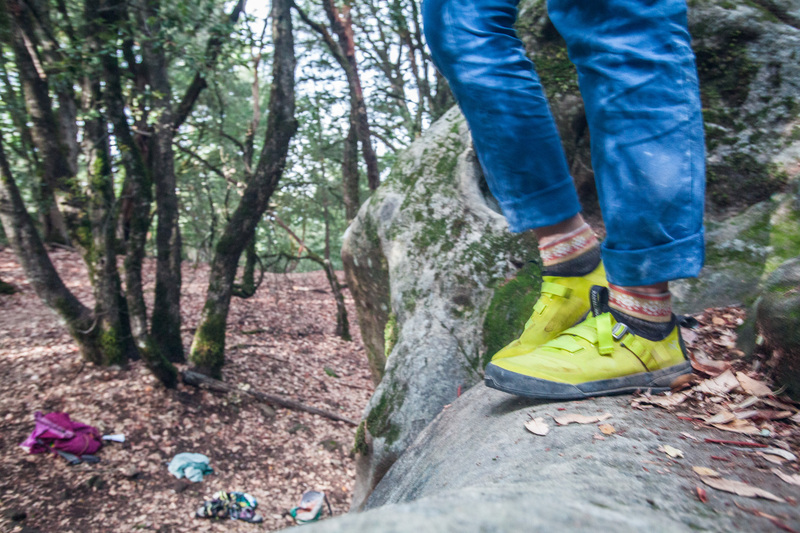 Arc’teryx’s MegaGrip™ rubber compound, designed in conjunction with Vibram, is durable and keeps you stuck on the rock. For those of you who hate laces, the Arakys are a tighten once, buckle up, and never mess with the fit again kind of shoe. I love the unique colors that Arc’teryx have come up with for the shoe. They’re snazzy, they’re obnoxious, they’re great. The shoe fit, even when tightened down, is not that great. I found that there is a lot of dead space around the front of my foot, especially in the toe box. For an approach shoe with sticky rubber, this makes it tough to climb in. I wear a size women’s 6.5. I have kinda big feet for how short I am. These make me feel like my feet look even more huge and clown-like, especially in such a loud color. I was psyched to wear these around the city, but I don’t do so as much because my feet look SO BIG. These aren’t a long, technical approach shoe. But for those days where the approach is ten minutes and a lot of lounging is in the forecast, these are perfect. I’ve definitely tried collapsing the heel on my other approach shoes, but to no avail. If you are looking for an all around approach shoe, these won’t be it; they are pretty niche. Buy through Arc’teryx, Amazon, or Backcountry for $150.